Common Femoral Artery: Mine? Yours? Oops! Over the course of the past two decades, advances in endovascular interventions have dramatically changed the way we treat vascular disease. Targets that once were sacred to the gold standard of open surgery have been converted to a minimally invasive approach, where the impact on the patient is lessened and the quality of the outcomes preserved. Many of us, vascular surgeons included, now employ an “endo first” approach to peripheral arterial disease, and reserve surgery as a provisional option for prohibitive anatomy and recurrent disease. That being said, the common femoral artery (CFA) remains a controversial territory, and many still view it as the sole domain of the vascular surgeon. Historically, common femoral endarterectomy (CFE) has been associated with excellent outcomes. Surgical series cite a high rate of technical success, good long-term patency, and reasonable return to function for the patient. It is hard to argue that any therapy other than CFE is appropriate in the “right patient”. Of course the right patient is in the eye of the beholder. We all recognize that what a patient is offered is very often related to who they present to for an opinion. Our challenge, regardless of our discipline-orientation, is to truly offer the patient the best option. Current practice has introduced a number of devices that allow for endovascular treatment of CFA disease. Simple angioplasty with provisional stenting has been reported to have good technical success, reasonable patency, and minimal complications. Data with more advanced devices and multi-device therapy is lacking, but in individual cases one can achieve sustainable results. Anti-proliferative balloon therapies (cryoplasty, drug coated balloons) may limit restenosis; atherectomy devices may allow for important debulking; and fracture-free, drug eluting stents or stent grafts may provide durable patency…time and trials will tell. As the portal of flow to the profunda, the true lifeblood of the leg, the CFA needs to be treated with equal attention before and after intervention as well. VIVA Physicians have initiated an educational module promoting the routine use of ultrasound-guided micro-puncture access for all interventions. This effort is intended to help endovascular specialists to establish quality initiatives in their home institutions. The old standard of “palpate, poke, and pray” exposes each of our patients to unnecessary risks. The ability to truly “see” the CFA with ultrasound, to determine the exact location of the profunda bifurcation, and to avoid plaque and calcification ultimately low for much safer access. Such an approach also benefits our interventional exit strategy as it helps to guide and select methods of vessel closure. Ideally, the approach to the common femoral artery should be an “ours” approach…it should be done collaboratively with multi-disciplinary input. This is especially true when it comes to large-bore access. Proper consultation between non-surgical interventionalists and cardiac and vascular surgical colleagues is essential for patient safety and outcomes. Suture-based closure devices have enabled us to percutaneously perform EVAR’s, TEVAR’s, and TAVR’s with a high degree of success. 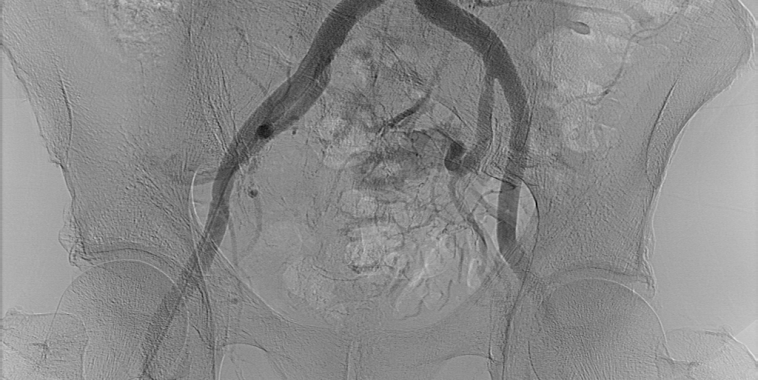 This approach, however, is far from perfect and failed percutaneous closure is not the time to figure out what your back-up plan is going to be. Our institution recently instituted a large bore policy to insure that appropriate surgical backup is in place prior to starting any procedure involving a 14F sheath or larger. Such an approach insures optimal patient safety and stands to further improve our interventional outcomes.